Vantaris Hotels in Kavros, Crete were built on the north and east sides of Chania on the longest beach in Crete. 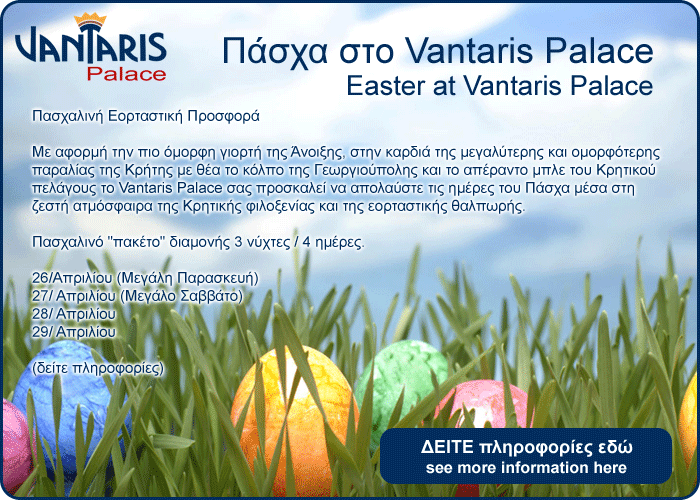 Vantaris Hotels consist of 3 different hotels, Vantaris Palace 4*, Vantaris Beach 4* and Vantaris Garden 1*, suitable for families with children, and promise an unforgettable holiday in Crete. Starting on the highway from Chania – Rethymno Vantaris Hotels end up at Kavros beach with its crystal clear waters and golden sands, 4 km from Georgioupolis. This was our first experience of Crete. I went with my two children – 11 and 13. The location of the hotel is Kavros, right on the beach so you have the choice of pool or beautiful sandy beach. Georgeopolis and when you get there – takes about 35 mins, you are rewarded with a beautiful quaint Greek village. The children were really sad to leave – so was I! finished being served but the waitresses happily bought us some food and made us feel very welcome. The waiters and waitresses were very friendly throughout our stay, especially the dinner staff. The variety of food was also amazing. There was a massive amount of choice from salads to traditional Greek dishes. There were lots of places you could visit in Crete. We went to Georgioupolis and Rithymna. Both were both lovely, but Rithymna being like the main town of the west side of Crete meaning it was a lot busier. There were very good bus services, however in Rithymna the bus station was rather hectic! The beach was lovely and the life guards were very vigilant especially as at the end of our stay the waves were very big and strong. The bar lady was also extremely friendly, and we were the only English people staying in the hotel which was very nice. Most of the other guests came from around Germany. The pool was also very clean and so was the fitness centre and indoor pool. Overall, we had an amazing stay and came away feeling very refreshed and relaxed and with a tan! We would definitely return to this hotel again.